I happened to catch the legendary French Chef Daniel Boulud preparing Provencal Lamb Daube on LIVE with Kelly and Michael the other day and was totally wowed by his recipe. 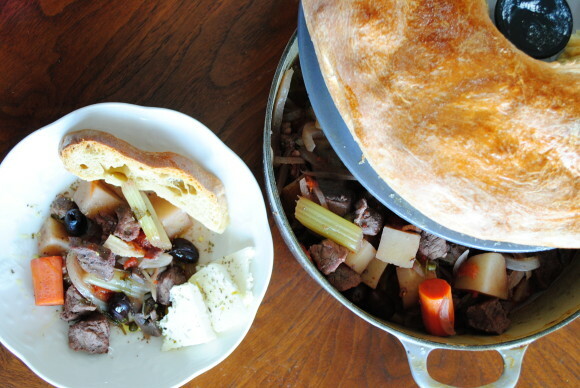 Not only did I love the idea of marinating tons of yummy veggies and beef overnight with an entire bottle of red wine, but I LOVED the fact that he baked bread on top of the lid of a LeCreuset dutch oven. It was genius. I ran to the Strip district in Pittsburgh yesterday afternoon and purchased 2 1/2 lbs. of fresh bread dough from Mancini’s Bakery. 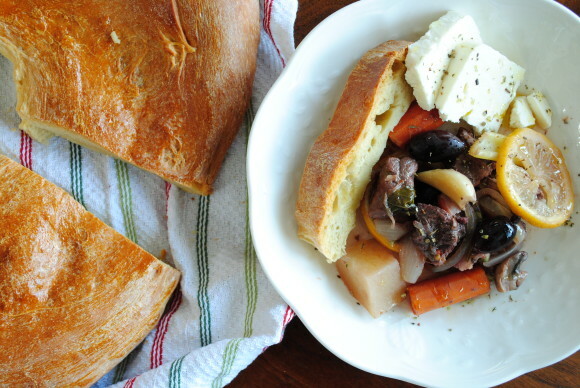 Not only did my house smell amazing as the stew roasted and the bread baked, but all three of my children absolutely loved the end result, as did my husband and I. I’ve come to the conclusion that this is the perfect meal to prepare for holiday guests. In fact, I am making it for my big Greek family next week when we celebrate Christmas. I am loving the fact that I can prepare almost the whole meal the night before and thoroughly enjoy our family on the actual holiday. Thank you, Chef Boulud for inspiring this home chef to create something perfectly festive and special for the holidays! This bread is perfectly crusty on the top and soft on the bottom…perfection indeed!! To my family…don’t worry…spanokopita is still on the menu, too!! In a large Dutch oven, combine the first 19 ingredients. Stir with large wooden spoon and drizzle with olive oil. 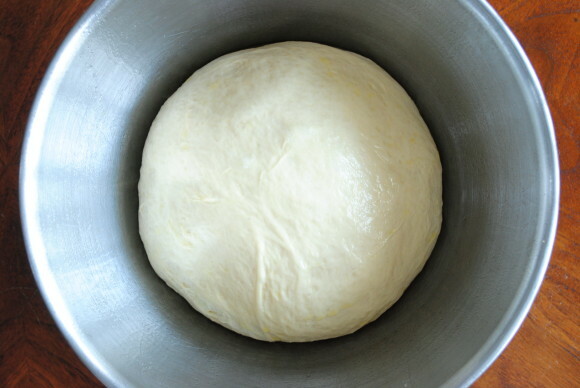 In the morning, retrieve bread dough from the refrigerator and place in an oiled bowl. Cover with a damp cloth and place in a warm area to allow for rising for about 1 hour. Whisk the egg yokes and brush across the lid of the dutch oven. Sprinkle with flour. 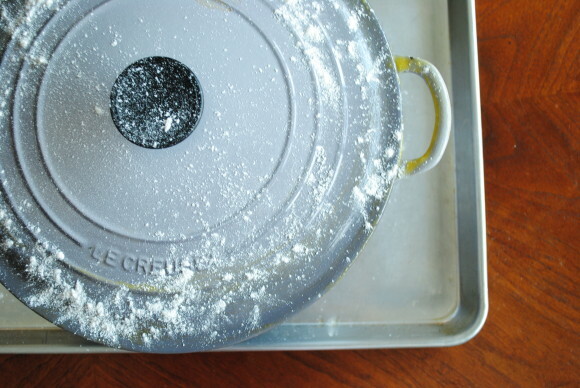 Using your hands, form the dough into a wreath and place on the top of the dutch oven, covering the entire lid, but for the handle in the center. 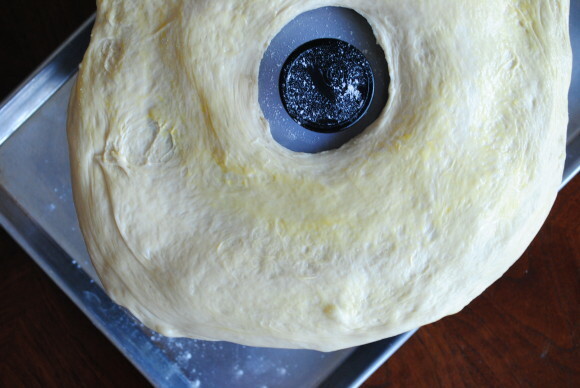 Brush the dough with egg yoke. Place in the oven and bake at 425 for 30 minutes. Reduce the temperature of the oven to 275 degrees and continue to cook for 2 1/2 hours. 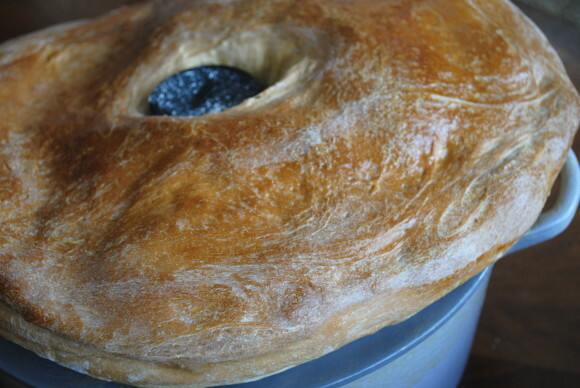 Allow to cool for 10-15 minutes, gently remove the bread from the lid. It should come off in one large wreath. 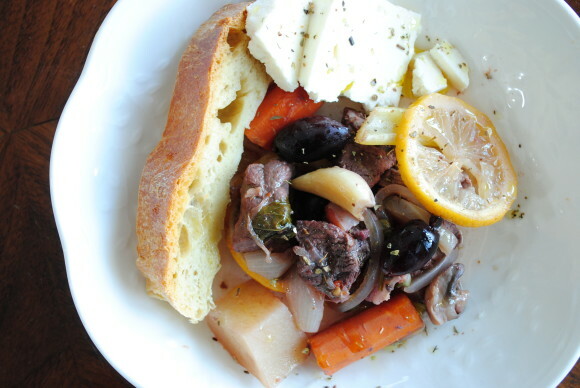 Spoon stew into bowls, sprinkle with dried Greek oregano, drizzle with olive oil, and serve with feta cheese and large piece of warm bread. 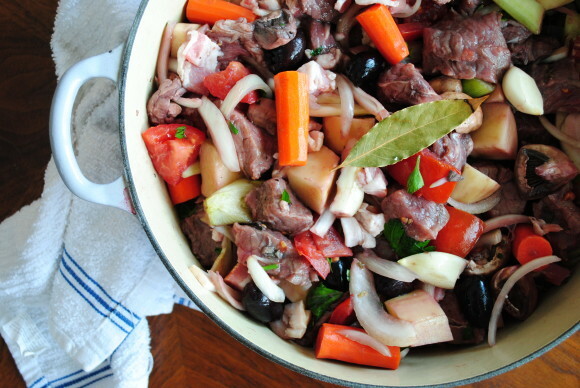 *** This recipe is adapted from Chef Daniel Boulud’s Provencal Lamb Daube, as seen on LIVE with Kelly and Michael on December 18, 2013. This is delicious….perfect on a cold winter day! Thank you, Athena!! So glad you liked it!